Before I get this ball rolling, let me start out by saying that our family is truly blessed. I have been ill for a while now with gastrointestinal issues, with an intermittent low-grade fever. This has also affected my underlying respiratory issues. I had a doctor’s appointment today, where I was diagnosed with diverticulitis. This has caused me so much discomfort, but at least I now know what is going on. I am thankful for a caring and attentive physician, who is on top of it to get me feeling better. I have a followup appointment in 2 weeks, at which time I may go in for a colonoscopy (happy 33rd to me)! I would like to say that I will not worry, but that would be a lie. I know my problems pale in comparison to others, but am asking for prayer nonetheless. My dad goes for a followup oncologic appointment in October (it will be 2 years from his diagnostic treatment for pancreatic cancer). He is also battling an infection of his eye. Prayers for him as well please. He and I will be attending counseling at the VA to work through the emotions of being without mom 😢 Prayers also that the counselor(s) are Christian. A customizable combo of strength, HIIT, functional training, cardio, Pilates & yoga workouts for safe, sustainable results. You'll do a different workout video every single day; no repeats. One of our favorite programs! Have a sweet tooth? 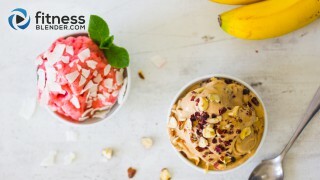 satisfy your tastebuds with this easy to make healthy desert!